david keene | XKV8R: The Official Blog of Robert R. Cargill, Ph.D.
“Writing the Dead Sea Scrolls” is scheduled to re-air on NatGeo December 11, 2010. I’ve previously posted about this here. If you’re interested in the Dead Sea Scrolls, this is the show to watch. 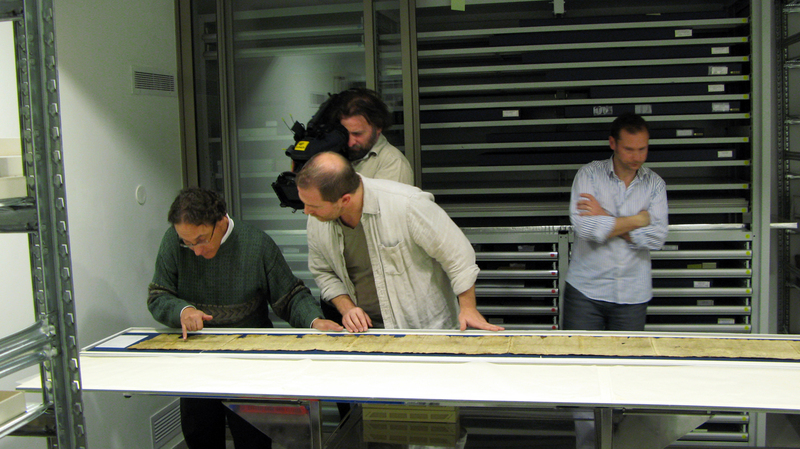 National Geographic Channel aired the documentary Writing the Dead Sea Scrolls this evening, Tuesday, July 27, 2010. It was accompanied by a UCLA Today story by Meg Sullivan and an article entitled, “Dead Sea Scrolls Mystery Solved?” by Ker Than on National Geographic News. I wrote about the making of this documentary in a blog shortly after returning from filming it in January 2010. I’ll let others critique the show (you’re also welcome to praise it, but such is usually not the nature of Qumran studies ;-). I shall offer here just a quick summary of what the producers were trying to do with the show. The point of the documentary was to highlight the most recent scholarship on Qumran and to get the different, often warring sides talking to one another. As a relatively young scholar in this field, I was asked to investigate the new claims to see what they have to offer. No one theory answers all of the questions about the Dead Sea Scrolls, and no one Qumran scholar owns the whole truth. The traditional Qumran-Essene Hypothesis – where Essenes built Qumran and wrote the Dead Sea Scrolls there – has slowly been losing support over the past decades. Other theories have been offered in its place, but many of these theories take extreme positions claiming, often rancorously, that the scrolls have nothing to do with Qumran and that the scrolls are the products of anyone but the Essenes. These alternative theories have just as many problems, if not more so. This documentary hopes to show that the answer lies somewhere in between, and that only when all sides work together as professionals and actually talk to one another in a professional dialogue can we begin to reach a viable solution to the question of who wrote the Dead Sea Scrolls. There is a tremendous congruency of ideology within the sectarian manuscripts, which make up a significant portion of the Dead Sea Scrolls. There is a congruent, yet unique messianic expectation (or expectations), interpretation of scripture, halakhic interpretation, and a unique, but consistent calendar present within the sectarian manuscripts recovered from the Qumran caves. It is difficult to explain this congruence – the use of a solar calendar, references to the Teacher of Righteousness, Community Rules for life together in the desert, and especially the very low view of the Jerusalem Temple priesthood – within these sectarian documents if one argues they came from disparate libraries in Jerusalem. The Jerusalem Origin Theory (defined as: the Dead Sea Scrolls were in no way a product of anyone living at Qumran and came, rather, from various Jewish libraries throughout Jerusalem) creates more problems than it solves and has been dismissed time and time again. It fails to explain the congruency of ideology in the sectarian manuscripts. Likewise, the Jerusalem Temple Library theory (which argues that the scrolls are the product of the official library of the Jerusalem Temple) has also been discounted as it fails to explain why the Jerusalem Temple priests would preserve and copy literature that so negatively portrays their activities and emphasizes their illegitimacy. At the same time, it is difficult to explain some of the ideological diversity present within some of the scrolls if one argues that all of the scrolls were composed by a single sectarian group at Qumran. For example, why are the scrolls written in Hebrew, Aramaic, and Greek if they are the product of a single sectarian community? Likewise, the Copper Scroll from Cave 3 is from a later date than the rest of the scrolls, is written on a different medium, and in a different dialect (some say language) of Mishnaic Hebrew. We simply cannot consider the Copper Scroll the product of a community of Jewish sectarians living at Qumran. Therefore, it is possible that more than one group or groups hid documents in caves surrounding Qumran. Based upon the evidence, it is possible that a group of sectarian Jews took up residence in the former fortress that was Qumran, brought scrolls with them to the site, copied and penned other scrolls, and hid them all in the nearby caves during the suppression of the Jewish Revolt by the Romans. They may or may not have been Essenes (although the Essenes are still the best candidate for the sect at Qumran). The theory examined in this documentary (a Multiple-Cave, Multiple Author theory, or whatever you choose to call it) explains both the congruence and the diversity within the scrolls, and it explains the development of ideological and theological thought contained with the scrolls from one of strict halakhic interpretation to one that incorporates and develops apocalyptic and dual-messianic expectations, as well as rules for life together as a community. This is not to say that the Multiple Cave Theory is not without problems. The statistical analysis is still in need of serious review and critique, and a theory that argues that different caves “belong to” or “represent” different sectarian groups may be overly simplistic. However, it is a new attempt to explain the congruency and the diversity of the Dead Sea Scrolls and is worthy of examination. Simply put, some of the scrolls could be the product of a sect within a movement (if I may so summarize John Collins) that resided at Qumran, and other scrolls may be the product of other groups that hid scrolls in many of the caves nearby Qumran. This explains the congruency of sectarian ideology and the diversity of the scrolls, as well as their presence in caves both in Qumran’s backyard (Caves 7-9, 4-5) and those some distance from Qumran, as well as explaining the nature of the archaeological expansions made to the site of Qurman, which appear to be in a communal, non-military fashion. On this last topic (the archaeology of Qumran), I shall dispense with the equally difficult discussion about the origin and nature of the Qumran settlement. While some have argued that the Essenes built the settlement from the ground up at a date ranging anywhere between 150-50 BCE, I have argued that Qumran was initially built as a fort, was abandoned, and was reoccupied by a small community of Jewish sectarians who were ultimately responsible for collecting, copying, and even composing some of the Dead Sea Scrolls. (In fact, I can recommend an excellent book on the subject. ;-) You will notice, however, that I nowhere in the documentary touted my own theory. Rather, my job was to investigate other scholars’ claims and to assess all of the evidence fairly and without prejudice. The producers chose the interviewees and setup the interviews, and I had the opportunity to talk to this diverse assemblage of archaeologists and scientists and ask them about their research. The point of the documentary and of the producers’ approach was to do less of this, and have more of the professional exchange of ideas and more of the kind of scholarly and public dialogue that a documentary like this can generate. It is possible to discuss Qumran and the Dead Sea Scrolls without resorting to aliases and anonymity, without abusing one’s position to suppress new ideas, and without doing drive-by hit jobs on the personal lives of graduate students and scholars with whom you disagree. This documentary is an example of how one can facilitate a discussion amongst a number of scholars – many of whom disagree strongly – and present the new information, responses to these new ideas, and allow the viewer (both scholar and non-specialist alike) to make an informed decision. It is hoped that this documentary can shed light on the new research surrounding the Dead Sea Scrolls, and can serve as an example of how scholarship can be done professionally and collaboratively in this new age of modern media and the Digital Humanities. The Dead Sea Scrolls are important because they are the oldest known copies biblical manuscripts we have. They are important because they demonstrate the length Jews were willing to go to protect what they considered Scripture. The scrolls are important because while they have nothing whatsoever to do with Christianity (i.e., nothing to do with John the Baptist, James the brother of Jesus, Jesus, or the early Christian community), they demonstrate that the Christians were not the only Jewish sect reinterpreting Hebrew scripture and applying it toward their leader (the “Teacher of Righteousness” as opposed to Jesus), awaiting a Messiah (actually, two Messiahs were expected at Qumran as opposed to only one (Jesus) in Christianity), engaging in ritual purification (cf. baptism in Christianity), holding property in common (cf. Acts 2:44-45), and awaiting a final, apocalyptic battle (cf. the War Scroll at Qumran and the New Testament book of Revelation). The Dead Sea Scrolls show us the importance of scripture and its interpretation to Second Temple Judaism. My thanks to Executive Producer Ray Bruce and CTVC for producing the show, choosing the scholars, and allowing much of their new research regarding Qumran to come alive. Thanks also to Producer, Director, Writer, and fearless leader John Fothergill for his excellent direction, script, vision, support, encouragement, and enthusiasm in making this project. Thanks also to associate producer Paula Nightingale, who made everything happen when it was supposed to, and to Director of Photography Lawrence Gardner, who shot a beautiful show, and to Sound Engineer David Keene for making the show sound so wonderful (as well as for the many great late evening laughs). Thanks also to Israeli producer Nava Mizrahi and to Antonia Packard for making everything in Israel pleasant and expedient. May we share many more adventures together. 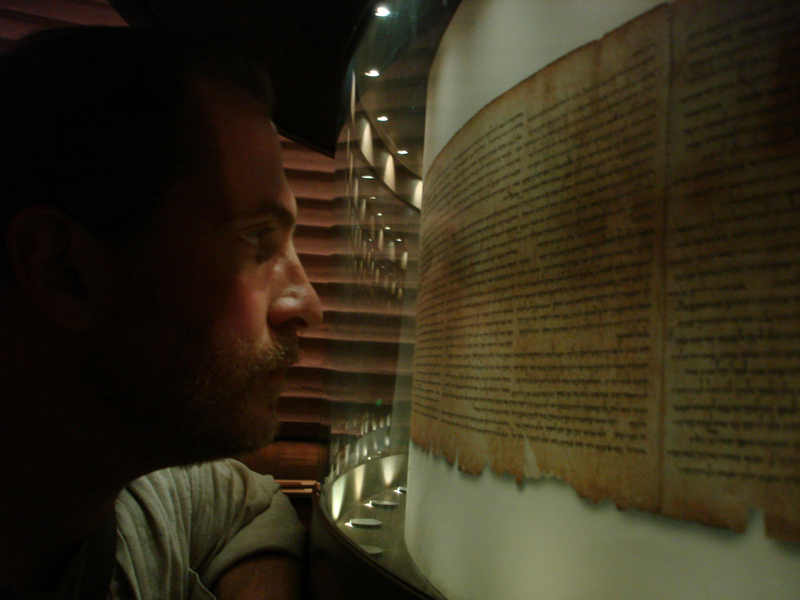 Dr. Robert Cargill viewing the copy of the Great Isaiah Scroll at the Shrine of the Book in Jerusalem's Israel Museum. the documentary is designed to take all evidence into account, including the site of qumran, the known sects of the second temple period, the caves in which the dss were found, and the contents, shape, size, date, paleography, orthography, language, and ideology of the scrolls themselves. we discussed several aspects of the scrolls including what it meant to be understood as ‘jewish’ in the second temple period. would orthodox zadokites have understood pharisees to be ‘real’ jews? how about essenes? can one be perceived as jewish if one celebrates yom kippur and passover on a date different from other ‘orthodox’ jews? what does it mean that some jews followed different calendars? what if they believed in various versions of an afterlife if they even believed in an afterlife at all? what happens if different groups claim different biblical canons or have a different understanding of what is ‘scriptural?’ what happens if they expected different messiahs or even multiple messiahs? that is to ask, how far can one stray from orthodox temple judaism before one is no longer considered ‘jewish’ and is considered something else? on my trip, i visited the kidron and og wadis. i walked through ronny reich’s excavation in the drainage tunnels leading from the temple mount to the kidron valley. i dug the destruction layers at en gedi with gideon hadas and climbed atop masada to ask what copies of genesis, deuteronomy, leviticus, psalms, ezekiel, and most importantly, songs of sabbath sacrifice (fragments of which were also found in qumran caves 4 and 11) would be doing on top of the mountain fortress. 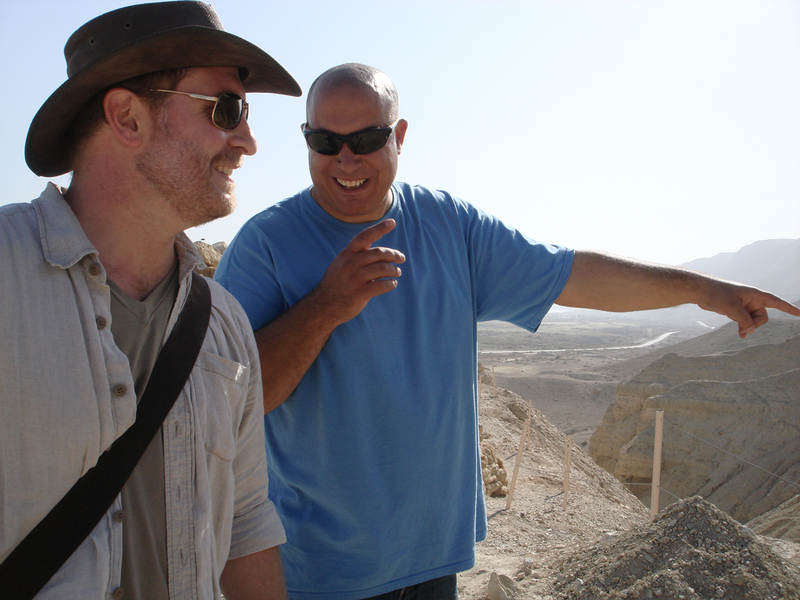 i walked around qumran with yuval peleg and had him interpret the site for me based upon his ten seasons of excavations there. we later had a drink at the american colony and discussed the various interpretations of qumran and a couple of recent scandals surrounding the study of the scrolls. i read from the actual isaiah scroll in the basement vault of the shrine of the book with curator adolfo roitman. i held actual scroll jars and viewed roland de vaux’s actual field notes at the école biblique with jean-baptiste humbert. i walked around the walls of jerusalem to what shimon gibson believes to be the gate of the essenes. 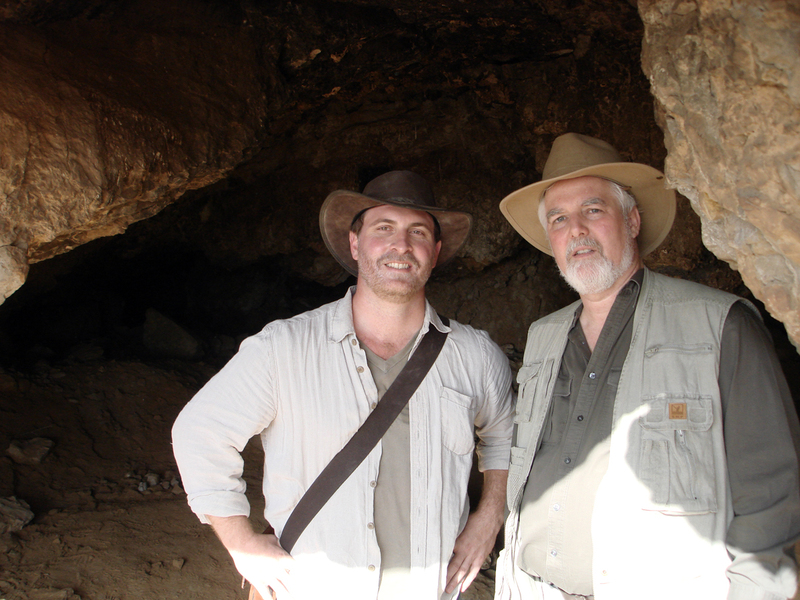 i visited cave 11 with stephen pfann and listened while he explained his multiple cave theory. i visited the israel antiquities authority’s organic materials lab and had orit shamir show me the scroll linens, the tefillin (phylacteries), wooden bowls, and other domestic items from the caves like combs and sandals. i visited the iaa’s restoration lab with pnina shor and watched as her crew restored fragments of the dss and prepared others for travel abroad for exhibition in the united states. the production crew was wonderful. led by ctvc executive producer ray bruce, the field team consisted of director/producer john fothergill, associate producer paula nightingale, director of photography lawrence gardner, sound engineer david keene, israeli producer nava mizrahi, and antonia packard. when it was all said and done, i felt fortunate to have had the opportunity to follow the path of the dead sea scrolls from their creation to their hiding, their discovery, restoration, and exhibition. i have a much better picture of who really wrote the dead sea scrolls. did the essenes really write them? some of them? were the scrolls written at qumran or elsewhere? should we even consider the dead sea scrolls a single corpus? or, should see it as a bunch of different collections of writings from various different jewish groups throughout the land? want to know what i think? it might surprise you. keep your eyes peeled in april for the national geographic channel’s presentation of the answer to the now 60 year old question: who really wrote the dead sea scrolls? 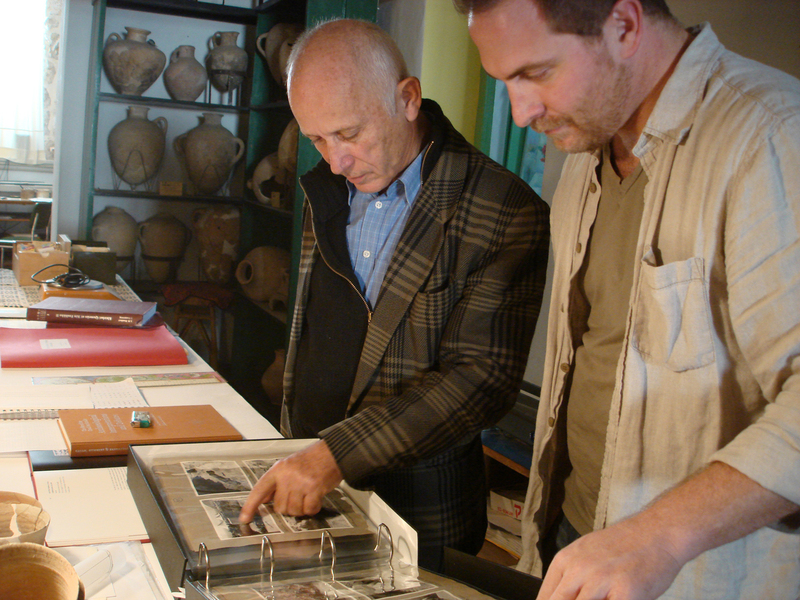 Robert Cargill and Jean-Baptiste Humbert with the Dead Sea Scrolls collection at the École Biblique in Jerusalem. 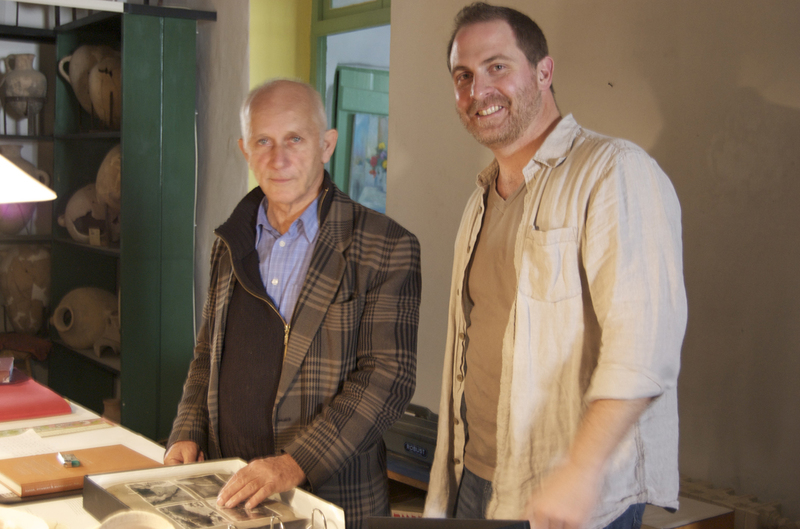 Robert Cargill and Jean-Baptiste Humbert reviewing photographs and Roland de Vaux's actual field notes at the École Biblique in Jerusalem. 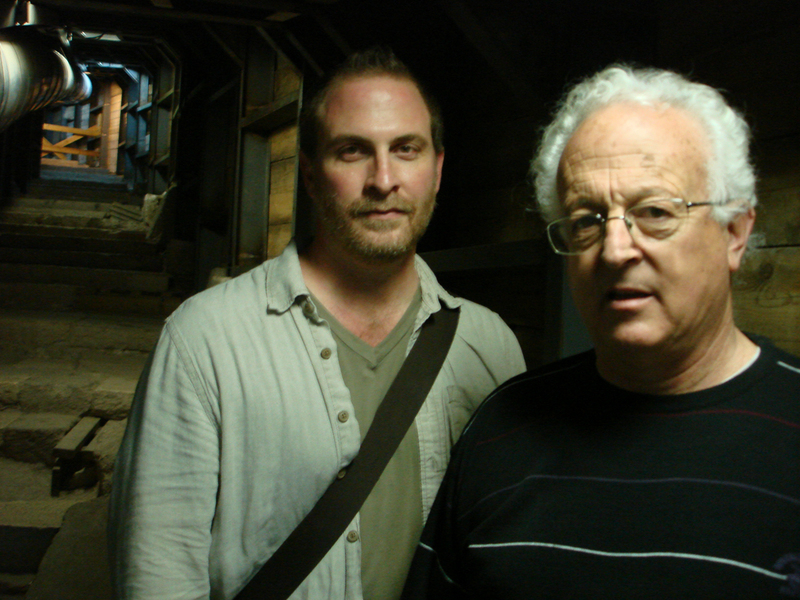 Robert Cargill and Ronny Reich in the drainage tunnels leading from the Jerusalem Temple Mount to the Kidron Valley. Robert Cargill and Pnina Shor in the Dead Sea Scrolls Conservation Lab of the Israel Antiquities Authority in Jerusalem. Adolfo Roitman, Curator of the Shrine of the Book, reads from a portion of the Isaiah-a Scroll discovered in Cave 1 at Qumran. The Isaiah-a scroll is presently housed in the vault of the Shrine of the Book in Jerusalem. 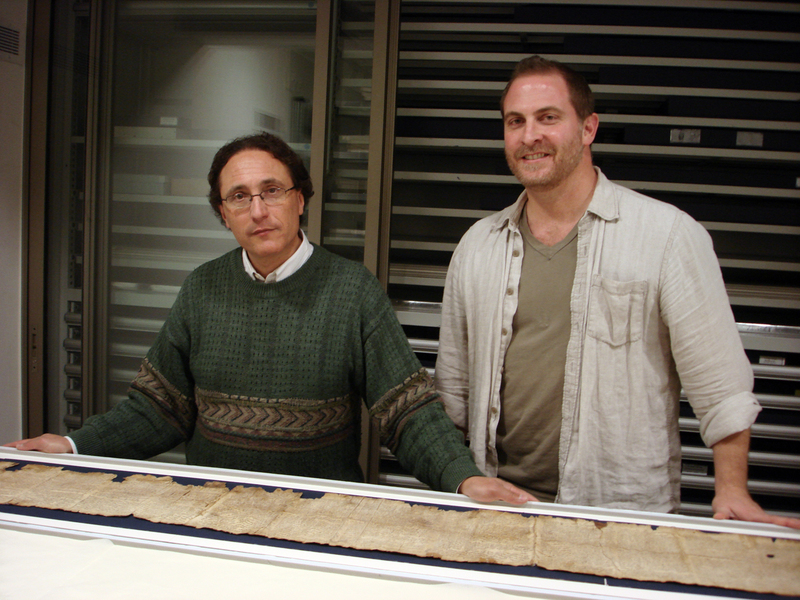 Robert Cargill and Adolfo Roitman viewing a portion of the Great Isaiah Scroll in the vault of the Shrine of the Book in Jerusalem's Israel Museum. 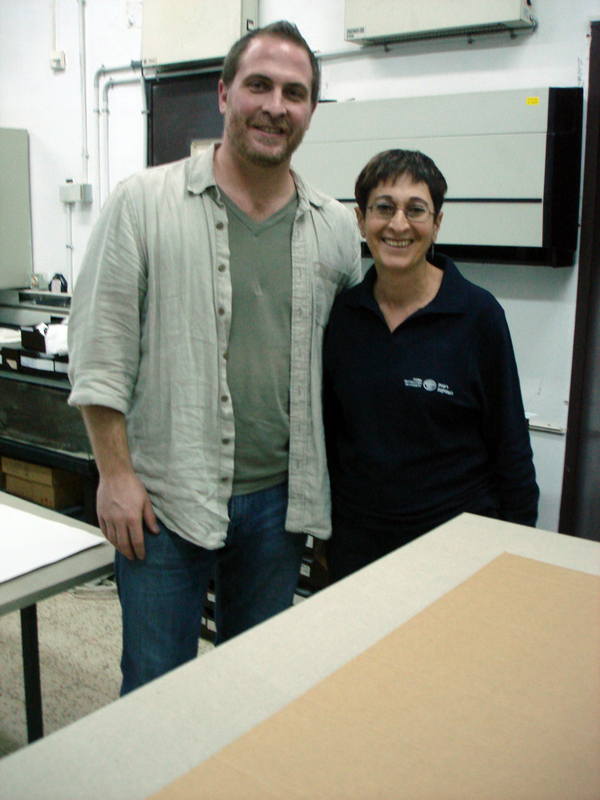 Robert Cargill and Orit Shamir at the organic materials lab of the Israel Antiquities Authority. 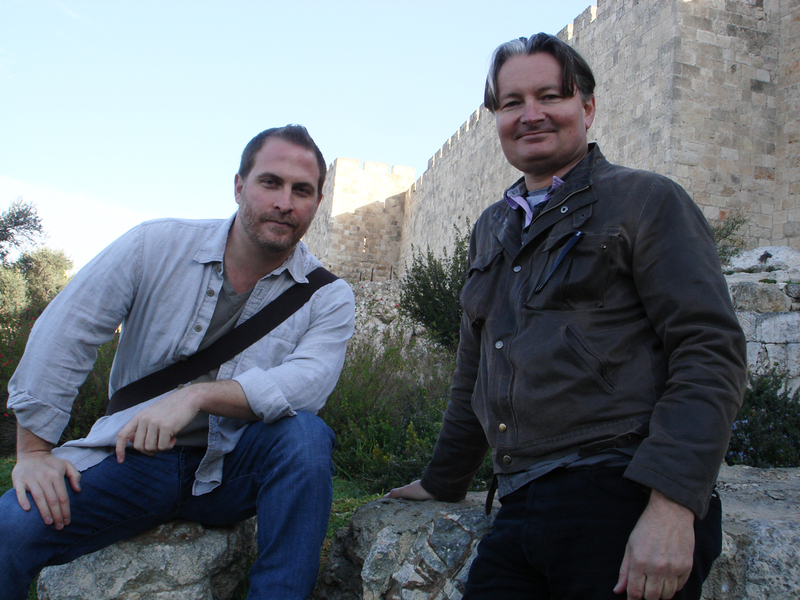 Robert Cargill and Shimon Gibson at the Wall of the Old City of Jerusalem. 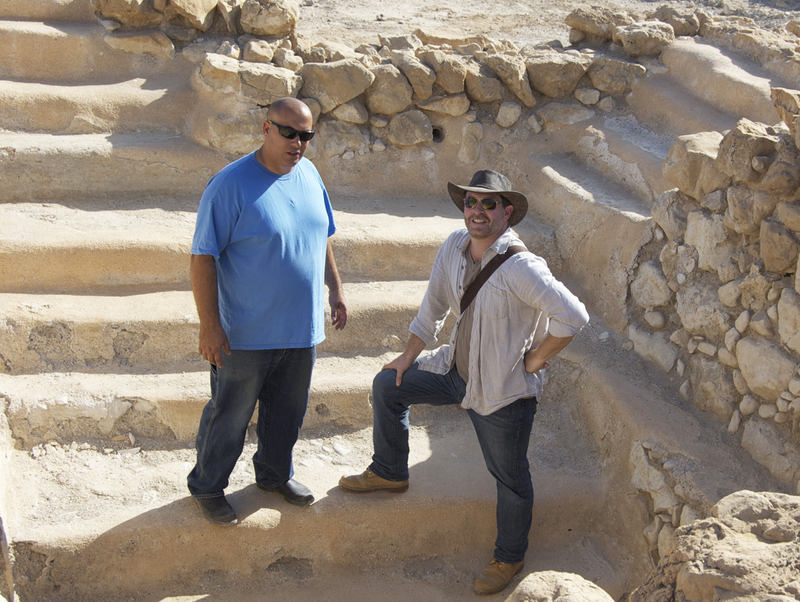 Robert Cargill and Yuval Peleg in the locus 138 miqveh (ritual bath) at Qumran. Yuval Peleg shows Robert Cargill parts of his excavation at Qumran. 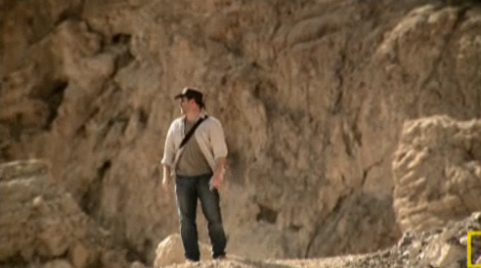 Robert Cargill and Stephen Pfann in Cave 11 near Qumran.